Let’s end the week with another little finish – and a request at the end of the article. 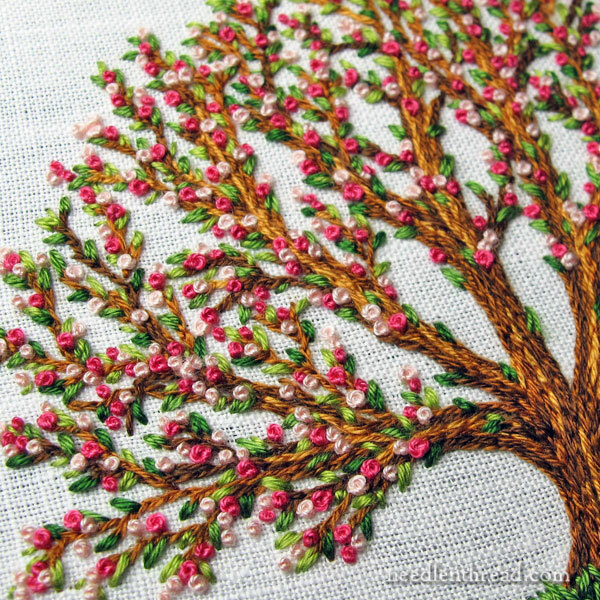 Today, it’s the blooming tree, worked in three very simple stitches. And that’s really what I like best about this particular project. It illustrates how simple stitches can work together to create a pretty nice finish. Embroidery doesn’t have to be complicated. So, here’s the finish and some particulars. You can click on the images to view them larger, if you like. The whole tree, from the base of the grass to the topmost branches, is 2.75″ high. It’s just sightly wider than that, at its widest points. 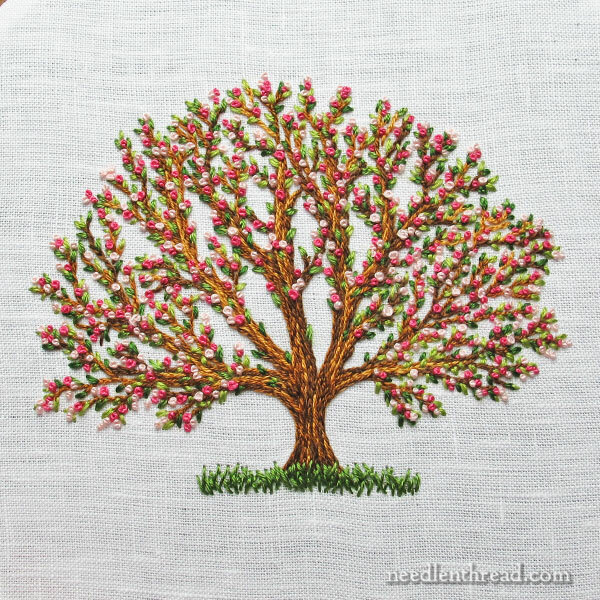 The embroidery on the tree consists of three stitches: split stitch, straight stitch (or tiny seed stitches, sometimes doubled), and French knots. While the stitches are pretty simple, the colors involved are a little more complex. There are five shades of brown in the tree, three shades of green, and two shades of pink. The line of grass at the base of the tree is worked in random straight stitches, just to give a grassy ground for the tree. Now, the nice thing about a tree like this is that it can stand isolated if you want. You could frame it, you could include it on a crazy quilt, you could make a journal cover out of it, or a needlebook, or any number of things. But you could also incorporate it into a larger scene, like embroidered gardens, landscape embroidery, castles and fairytales – whatever you’re embroidering that could benefit from the presence of a tree. The pattern, instructions, and materials list for this will be released later on – it’s part of a series I’m planning, that I’ll tell you about a little later this year, after the overhaul on the website is completed and up and running. In the meantime, though, if you’re itching to stitch your own tree, you can take the information provided already and drum one up. Just pick out a range of browns, some good greens, and some blossom colors, doodle up a tree (it doesn’t have to be perfect! ), and you’re good to go! Seeking Contributors! What are you stitching? You know what the best thing about Needle ‘n Thread is? The involvement of like-minded stitching enthusiasts on the website helps make Needle ‘n Thread more than just a blog. Now and then, I like to feature reader’s work – to share what you’re stitching, to hear about what inspires you, to learn about your needlework journey, and to hopefully inspire others with your work and your stories. To that end, what are You stitching these days? Would you like to see your work featured on Needle ‘n Thread? If you’ve embroidered something lately that you’d like to show us, that you think will inspire others, that made you particularly happy (or maybe even particularly frustrated! ), that you enjoyed stitching, that you are proud of persevering through – whatever the case, whatever the level of stitchery, why not share it with us? If you’d like to contribute for future articles featuring reader’s embroidery, write to me at mary(at)needlenthread(dot)com. You can attach photos of your work right to your email. If you have a blog or website, a Facebook page or Pinterest board where you feature your work, feel free to include that information as well. If you don’t, don’t worry about it! If you like, you can browse through previous reader contributions here. I’m looking forward to hearing from you and seeing what you’re up to with your embroidery! Thank you for posting this information. I’m curious about this series you are planning. The finished tree is beautiful and the thread colours really blend in and complement each other I really like the green seed/straight stitches they are lovely, overall a stunning design. At the moment I’m currently involved in changing my room cutting curtains and making cushion covers that were in my old flat but are to longer the right size for my current flat. Also I’m collecting items for a wedding journal for my twin niece who is getting married next year. I’ve seen some beautiful journals on the internet and thought I would create one for her, this involves printing photos on fabric and collecting lots of doilies/lace and trinkets, embroidering monograms and other designs to add to the journal. I’ve made the journal book and after I’ve finished my curtains/cushions I will start to create a journal. Thanks for sharing the tree with us and for involving us in future readers work. I hope you have a great weekend. That’s exactly the sort of tree I’ve been imagining for a sampler I’m working on. Except I’d need to go smaller. Thanks! There’s something really cheering about this tree. Maybe it’s because it reminds me of Spring, and that’s always an exuberantly cheerful time of year. As opposed to being hugged, the tree looks like it wants to reach out and hug the viewer. Beautiful! I love the overall style! My biggest, ongoing embroidery project right now is a set of open-spine, handmade books. Well, technically, the covers and bindings are handmade. I’m re-covering some much-loved childhood books that have sentimental value for the owners, so the actual pages are original. The binding stitches are variations of embroidery stitches (mostly inspired by your Alphabet Sampler, btw), and I’ve stitched over a dozen test pieces to make sure that the stitches not only look beautiful, but are functional; as in, if the book doesn’t open and lie flat, the lovely stitching did not serve its purpose. The book covers are also embroidered (again, inspired by the Alphabet Sampler, as each book has the owner’s initials embroidered in the bottom corner). It’s a time-consuming project, but I’m (mostly) loving it! Hello Mary, I’ve been working on a couple of Trish Burr’s miniature designs to develop better skills in the area of shading and highlighting. I am also beginning to design a new Rosary Case for my niece with a picture of the Crowning of Mary in Heaven. She wants Mary to have a white Vail held by little angles and wearing a gold crown. So I may experiment with some gold thread. I’m learning so much and having fun. Thanks for sharing your creativity. I love the little tree. Beautifully spring-like! Just like the flowering plum I can see blooming in my neighbour’s garden if I lean back slightly in my chair. On projects – I embroidered the L from your stitch sampler alphabet for a young relative. She must love your design, as she is trying to copy the letter with pencil and paper. I’m hoping she’ll want to learn how to stitch her own so I will have someone worthy to inherit my stash. I’m working on a crazy quilt at the moment, but I always have something waiting in the wings. Thanks for all the ideas. I hope this project will inspire others to design and stitch their own concepts. I think lots of us psych ourselves out thinking design is complicated and has to be “perfect”. Not so. A small projects like this is totally within reach. Mary — here’s why you need to do kits of this. Although I dearly love embroidery, I have absolutely NO talent in drawing. None, zip, nada, doesn’t exist at all. And no matter how good I am at embroidery, if the basis of what I am embroidering is badly drawn, what I end up with will look yucky. And all those darling French knots! I LOVE French knots. What a heartwarming tree! Most of my embroidery interests center around folk and historic costume. I would love to see an article by someone whose focus is embroidered on clothing. There are lots of special considerations when embroidering garments, like durability and cost of material. I’d love to know how more experienced stitchers have met some of the associated challenges. Mary, I’m doing a two-day course at the Royal School of Needlework tomorrow and Wednesday, and I wondered if you would be interested in a write-up of the class for your blog? It’s a fun class – screen printing fabric and then embroidering the printed fabric. I am by no means an expert embroiderer, though I’ve been doing it for a while. Anyway, if you think your readers might be interested, let me know! Absolutely, Ros – that would be great fun! Don’t forget to take pictures! Hope you enjoy the class and I’ll look forward to hearing from you! Beautiful tree! Was the pattern and materials information ever released? This tree is one of my favorites! (I adore embroidered trees.) I am curious about what size threads you used. I’m guessing pearl cottons? Beautiful, beautiful work! I’m working on a Sunbonnet Sue quilt with landscaped backgrounds using scraps from the clothes I made for my daughter 40+ years ago. I’m embellishing the blocks with embroidery. The current block has a baby Sue in a white eyelet dress and bonnet sitting on a mint green “embroidered blanket” on the “grass” The background has tulips in front of two trellises with morning glories and yellow vines (a print with appliqued trellis, and some of the flowers and leaves stitched on top to give dimension.) Now I think that this tree would fit well between the trellises in the near distance. Each block has sunflowers and a cat (my daughter’s favorites) and this one also has a “stuffed toy lamb” which is french knots and satin stitched. I’ll post a pic when I finish the block. I’m wondering if I’ll finish the quilt before I’m senile. Sounds adorable! You can do it! Not yet! I’m working on a series of trees that will be published when I finish it. OMG!This is sooooo beautiful! I’m definitly gonna do it! I found your tree and its so beautiful!! I noticed comments going back to 2015… and im wondering if you have finished the pattern of that tree as pictured? If so, id like to have this pattern, thank you! Loving it!! Lindíssimo amo tudo sobre árvores, amo bordados. E os itens lindos. Quick question – Did you ever finish the series you were planning for this tree? You said that the pattern, instructions, and materials list for this will be released later on as part of a series you were planning, I just love this design and have been waiting anxiously unless I have just missed it. Hi, Lena – Not yet! It is on my list! You said that the pattern, instructions, and materials list for this will be released later on – it’s part of a series that you were planning. Have you released it yet? I am really looking forward to stitching this pattern. I think it is so lovely. If you haven’t released it yet, do you have an idea of when you will? I’m so sorry I didn’t realize you had already responded to me I am so sorry for asking you the same question again. Apologies. No problem! 🙂 Still working on it! I liked this little tree when you first shared with us. I’d like to try a tree in sillouette on a shopping bag with a dog or cat or bird somewhere in the mix. Maybe one green leaf could be interesting. Did you ever make the stitch series with this tree? I would love to stitch it! Hi, Jonelle – No, I haven’t gotten around to it. My plan was a series of four trees – it’s still on my List! I’ve loved this tree ever since you first posted it in 2015. You said, “The pattern, instructions, and materials list for this will be released later on – it’s part of a series I’m planning”. I cannot seem to find the pattern on your site. Did you ever release it & if so, where may I find it? If your plans changed regarding doing a series, can you tell me what fabric & threads you used to create this and the number of strands for the trunk and various sized French knots please. I would really like to try to re-create this type of tree design. I have only just recently rekindled my passion for embroidery since retiring. I am rather rusty. Actually, to be honest I feel like a novice. Almost as if I am starting from scratch since things have advanced so much. Not to mention there is so much more available now. Not only just supplies, but classes, techniques, etc. Thank you so much for your site and all the work, time, attention to detail and passion you put into it. It is truly appreciated. I truly enjoy & look forward to your posts. I’ve learned so much from you, thank you! Hi, Liliana – I have not released that yet, I’m afraid. I still have plans for it. It’s near the top of the list!